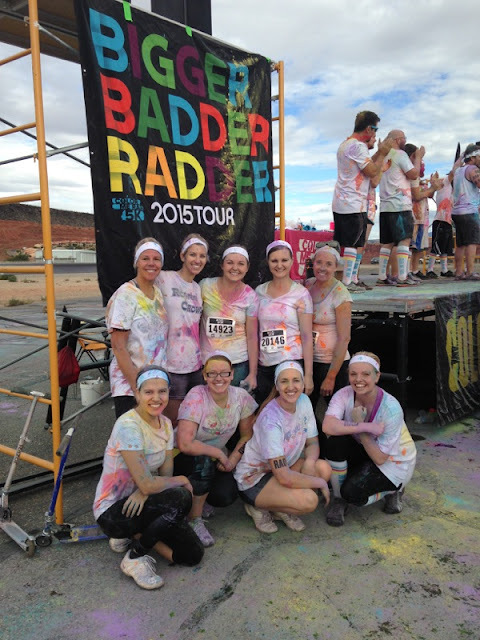 Southern Utah Attractions: My Experience Running Color Me Rad! My Experience Running Color Me Rad! Color Me Rad was sooo much fun! It was a lot more fun than I expected and I'm really glad I did it. I read a couple blog posts to know what to expect and learn some tips. Here are my tips for any of you who plan to run it someday. #1 Leave your phone with someone at the finish line. I really didn't need it while I was jogging. I thought I'd want it for pictures but we got plenty of pictures before and after. I just had my husband take some pictures of us as we came across the finish line. If you do want to bring your phone, put it in a plastic ziplock bag. You can then carry it, put it in a lanyard and tuck it under your shirt or wear a drawstring backpack. #2 Get there at least 45 minutes before your wave time. Color Me Rad will also tell you this in your e-mail when you sign up and I'd for sure follow this. It takes some time to park and walk from your parking spot to the entrance. You'll then want whatever time you have left to gather your group together and take some pictures. And there is a bunch of dancing and color bombing going on before you line up that you'll want to be a part of. #4 Wear sunglasses! As you're running through the color stations you get covered in powder and gel and you don't want that in your eyes! It goes everywhere! #5 Cover your car seats with towels or old sheets. I was really glad I did this. It made it so easy because all I had to do was throw them in the washer when I got home. #6 Spray your clothes with stain remover and wash them immediately after you get home. I thought for sure my clothes would be ruined but I was able to get them to come clean. I think that washing them immediately after I got home helped. 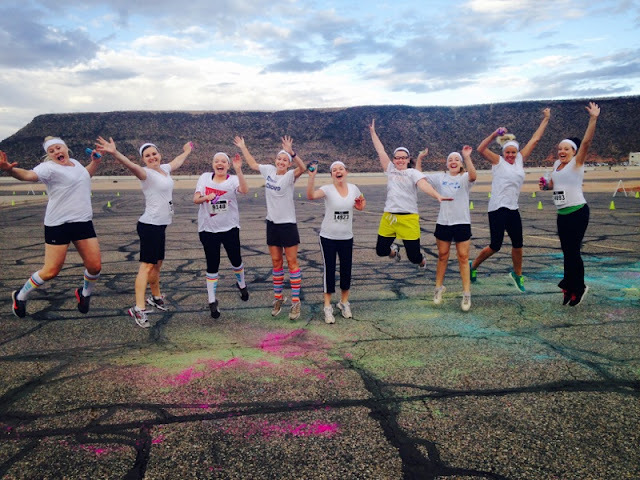 Next time Color Me Rad comes to St. George you really should sign up! You won't regret it! Here are some pictures of my group. To read more about the Color Me Rad 5K and find out when they are coming back to the area visit their website by clicking here.